techniques produce a tan by changing the color of the outermost layer of epidermis while the sun’s rays penetrate deep into the innermost layer of your epidermis. Therefore, a sun’s tan is more long lasting than other sunless tanning methods. Sunless tanning methods offer a tanning solution for people of all ages and categories. However, such tanning methods do not have the health benefits of sunlight. You definitely need to expose yourself to the sunlight for around ten to fifteen minutes, twice a week, to help your skin form the requisite vitamin D in your body. Vitamin D is necessary for the upkeep of your bones, muscles, body immune system and proper cell growth. Synthetic tanning methods cannot create vitamin D within your body. Tanning booths are in high demand these days. These booths use an airbrush system with an air compressor to tan your skin. This is a comparatively new technique of sunless tanning. This is as popular as spray tanning too. Airbrushes spray a tanning lotion to change the color of your skin. Airbrush has many compartments within it, containing a tanning liquid called dihydroxyacetone (DHA). FDA approves of the contents of this liquid and declares it safe for tanning your skin. The different pistons in the air compressor push out air through a nozzle in the spray head or airbrush. This combines with the tanning liquid within the airbrush and sprays a fine layer over your epidermis. You can retain your tanned look for around a week. Most tanning booths have around 36 airbrushes connected to the air compressor. Some of these are in a fixed position while some are in a moving position. You can remain under the fixed sprayers to get a tan all over your body. Otherwise, you can use a moving airbrush to tan specific parts of your body. Sometimes the moving airbrushes have different mechanical problems. 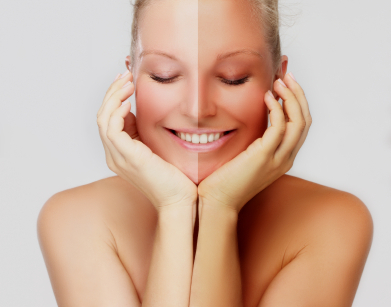 Airbrush tanning does not offer any long-lasting effect. Soon after a spray, you can wash off the color with soap and water. You can use this system to get a quick tan to attend any special events or programs. 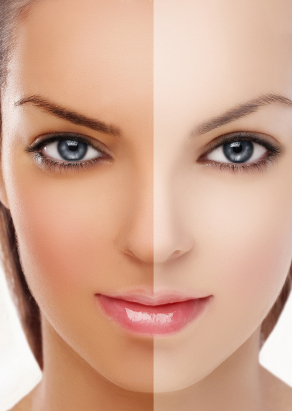 Airbrush tanning does not stimulate your skin to tan. It is suitable for all skin types. Sunless bronzers are available in the form of powders and moisturizers to help you get a tan. Application is easy and simple. You just have to apply these bronzers like your make–up to attain a tanned appearance. Sunless bronzers offer only a temporary tan. You can easily wash off the bronzers with soap and water. moisturizers outside, take care to check if they contain sunscreens among their ingredients. Tanning lamps are special tanning equipment that emit ultraviolet rays. The rays from these lamps are similar to those coming from the sun. Therefore, you need to safeguard yourself against the negative effects of ultraviolet rays while using tanning lamps to create a tan. Simple measures to check any negative impact are to strictly adhere to the recommended time and number of sessions, wear proper safety eyewear, place a protective acrylic layer between your skin and the lamp’s rays and follow all instructions on the booklet on how to use the tanning lamps for a good tan. It is best to have tanning sessions only on alternate days. Self-tanning lotions offer the simplest way to acquire a tan. These lotions contain dihydroxyacetone or DHA. This colorless sugar reacts with the amino acids of your body to produce melanoidins. These melanoidins are brown in color and therefore, your skin acquires a brown color. You can apply the lotion only to the topmost layer of your skin. As new skin appears, the old skin loses its color and tan. Therefore, you need to re-apply according to the instructions for that lotion. These lotions are the most common and effective way of obtaining a tan without venturing into the sun. You can get the needed tan within a few hours. There are no known dangers of self-tanning lotions. However, chances of allergic reactions persist. Pregnant women should avoid the use of self-tanning lotions. Some cheaper varieties of such tanning lotions contain certain herbal extracts, vitamins, and minerals. However, such cheap lotions do not always deliver the desired effects. You need to follow certain precautions while applying self-tanning lotions. Use appropriate gloves to prevent your fingers and palms from staining with the color of the lotion. Always apply in a circular motion and apply sufficient to get the needed tan. Uneven application causes streaking of the lotion resulting in an improper tan. Reapplying can make things worse. After proper application, wipe off any excess lotion from the knees and other vulnerable areas with a damp tissue. Most tanning salons have tanning beds with tanning lamps and bulbs to help you get a tan indoors. These bed lamps use UVB and UVC rays to get the requisite tan within few weeks of use. You can use the tanning bed at your home too. However, it is an expensive venture, as you need sufficient tanning lamps, bulbs and tanning bed lotions to achieve the desired result. Normally, Wolff tanning beds are among the best buys. Regular and proper use of a tanning bed delivers a more lasting tan than other sunless tanning methods. The F.D.A. does not approve the use of tanning pills. These pills contain canthaxanthin, a coloring pigment. Ingestion of the pill makes your skin turn brown or orange. However, side effects of this pill may be very serious and far-reaching. They may cause severe itching, liver problems and eye disorders. Many countries have withdrawn approval for the use of such tanning pills. There are certain tanning accelerators available in the form of pills and lotions to help you receive a faster tan. Normally, these lotions or pills contain tyrosine, an amino acid. This stimulates production of melanin to speedup the tanning process. However, the Food and Drug Administration (FDA) does not approve of these tanning lotions and drugs. Again, there is no conclusive medical evidence to assert their effects on melanin production. Sunless tanning lotions, creams and other techniques do not offer you any protection from the sun. Therefore, even after receiving a tan through sunless tanning methods, you need to use proper sunscreens while venturing in the sun. Only sunscreens can protect you from the harmful effects of the sun’s rays. Sunless tanning cannot override the benefits of tanning in the skin. Sunless tanning methods allow only minor skin penetration. Therefore, the effects of such tanning methods are also temporary and minor. any major internal infections or allergies. There are various factors for the growing popularity of sunless tanning. Many people live in places without much sunshine. Taking an expensive holiday to get a tan is also not a viable option for many people. Sunless tanning overcomes such factors – you can get a tan without much inconvenience. Regular exposure to sunlight to get a tan can also lay you open to various skin problems and damage. The different methods of sunless tanning are sunless tanning lotions, sprays, tanning beds and tanning pills. Each method of sunless tanning works differently and produces a tan, though the effect of some of them last longer than that of others. The main things you need to consider while choosing the appropriate sunless tanning method are cost, effectiveness, convenience and safety. Cost: The different sunless tanning methods are available for varied costs. Of all the methods, tanning sprays are the cheapest. The difference in cost between tanning sprays and other sunless tanning methods is well over a hundred dollars. Spray tanning offers the best and cheapest way to attain a sunless tan. You can use a manual spraying machine or you can visit a tanning salon and use airbrushes and sprayers to put the tanning solution evenly on all parts of your body. Uneven application can produce streaks in your tan. Tanning beds are the costliest option. If you want your own tanning bed at home, it could cost a lot, as you also need various accessories like tanning lamps, bulbs, etc. Similarly, using tanning beds in tanning booths is fairly costly. Effectiveness: Of the different sunless tanning methods, tanning beds are the most effective, offering the best tan which lasts for a longer time too. Tanning sprays give you a tan which lasts for only five to seven days. You need to apply the spray carefully and evenly. Otherwise, your tan will smudge. Tanning pills contain certain carotenoid pigments, which may be harmful to your health. Tanning lotions also offer a temporary tan – you need to reapply the lotion every few days to maintain your tan. Convenience: Tanning pills are the most convenient to use to get a tan. However, at the time of writing, the F.D.A. bans the use of such tanning pills because of reported side effects. Tanning sprays and lotions are convenient to apply too. Tanning beds offer the convenience of tanning yourself at home. However, not many can afford the convenience of their own tanning bed at home. Safety: The safest method of sunless tanning is through sprays and lotions. Tanning beds tan your skin in almost the same way as you bask in the sun to get a tan from the ultraviolet rays of sunlight. Tanning beds use ultra-violet rays off tanning bulbs and lamps. Excessive exposure to ultra-violet rays can cause premature aging and other skin ailments. compromises on cost, safety, effectiveness or convenience. However, before using spray tanning to get a tan, you should experiment with the different available sprays to check their relative suitability to your skin type. Sunless Tanning is popular and can help you to develop a tan without any exposure to the ultraviolet rays of the sun. Such a tan can look as natural as a regular suntan. Sunless bronzers and Tanning booths can help you get such a tan easily. Sunless bronzers are sunless tanning products available as lotions, powders, creams and moisturizers. Application of such bronzers is as simple as applying your regular make-up. Apply a particular shade to get the perfect tan. These offer a temporary stain, or tan, to your skin. However, you can easily wash them off with soap and water. Washing removes the tan too and you are back with your natural color and look. clothing for your body to prevent sunburns. Bronzers do not offer an even tan all over. They can only add a color to your skin. These booths offer an easy solution to help you with your self-tanning. All such booths operate with an air compressor and airbrush delivery system through spraying machines present within the booths. There are many pistons in the compressor to push air through a nozzle into the airbrush or spray head. These airbrushes have many compartments containing tanning solution. This solution contain dihydroxyacetone (DHA). The compressor pushes air into the airbrush, which then sprays tanning solution on your body in an even manner. Most tanning booths have as many as 36 airbrushes. Some are in a fixed position while some are in movable positions. You can use fixed airbrushes to get a full tan while moving airbrushes help you get a tan at specific body parts. Moving airbrushes often face many mechanical problems. Airbrushes at tanning booths help you get a full body tan, even in difficult parts like your back, shoulders, and cheek edges. Normally, sprays and lotions in airbrushes do not contain any element of sun protection. So, get adequate protection for your skin before going out. The Food and Drug Administration (FDA) approves use of DHA for external cosmetic purposes only. Nevertheless, DHA is unusable in places around your lips or eyes and you should neither inhale nor ingest it. It is difficult to adhere to these requirements in a sunless tanning booth using spray-tanning methods like airbrushes. Hence, inquire if sunless tanning booths offer sufficient protection against inhalation or ingestion of the tanning spray before using these booths. Tanning beds give you an artificial tan with the help of ultraviolet rays. Tanning beds use both UVA and UVB rays to tan your body. Emission of such ultraviolet rays can trigger production of endorphins in your body, which give you a high. Hence, some clients can develop an addiction for Tanning beds. Like to see new deals for rest of June n July please. We currently have Free Shipping for orders over $79!!! !